Thames & Hudson, 9780500343142, 496pp. The picturesque English town would be nothing without its steeple. Fifty English Steeples tours the fifty most important medieval parish church towers and spires in England, covering a period of some five hundred years. Historically accurate, this elegant volume represents five years of painstaking original research, captured in the informative text, high-quality new photography, and 175 immaculately presented line drawings. The introduction provides an overview of the technological and aesthetic development of steeples, and their medieval origins. The chapters that follow are devoted to a richly illustrated survey of the most beautiful and historically significant towers and spires in England, from renowned Saxon churches such as Earls Barton to those of almost cathedral proportions such as Salle in Norfolk or Chipping Campden in the heart of the Cotswolds. 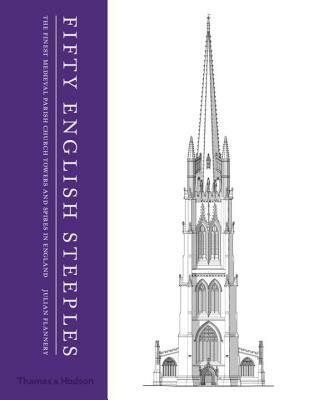 Julian Flannery's outstanding technical drawings of all fifty steeples complement this beautifully illustrated tome and help to shed new light on each tower and spire as a testament to the architectural, artistic, and engineering achievements of England in the Middle Ages.